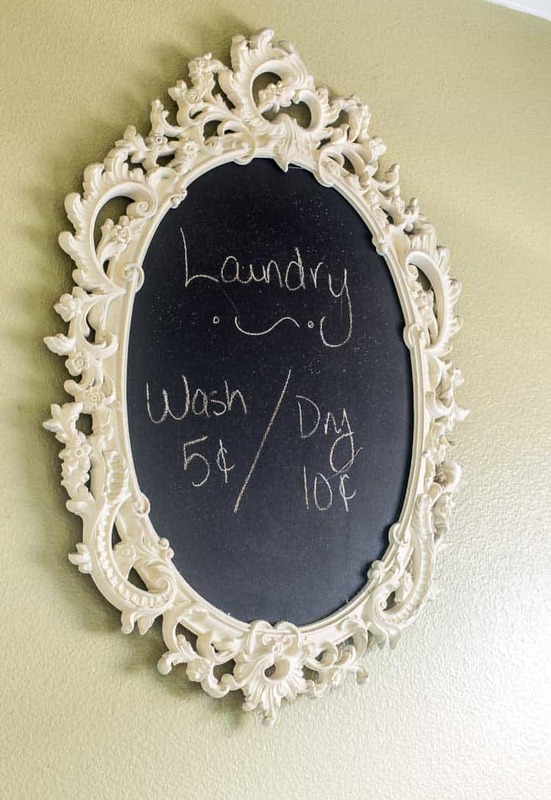 It’s time for a little thrift store makeover again and this time I turned a gaudy mirror into a chalkboard mirror for our laundry room. Here’s the gaudy mirror I started with. I love the scroll details on the frame, but the color wasn’t working with my home so I went with one of my favorite DIY products – PAINT! I started by spray painting the scroll frame with one of my favorite creamy white paints – Heirloom White. I gave it 2 even coats. Once the frame was dry I started on the chalkboard. Now trust me on this. You want to prime the mirror before you put on the chalkboard paint. 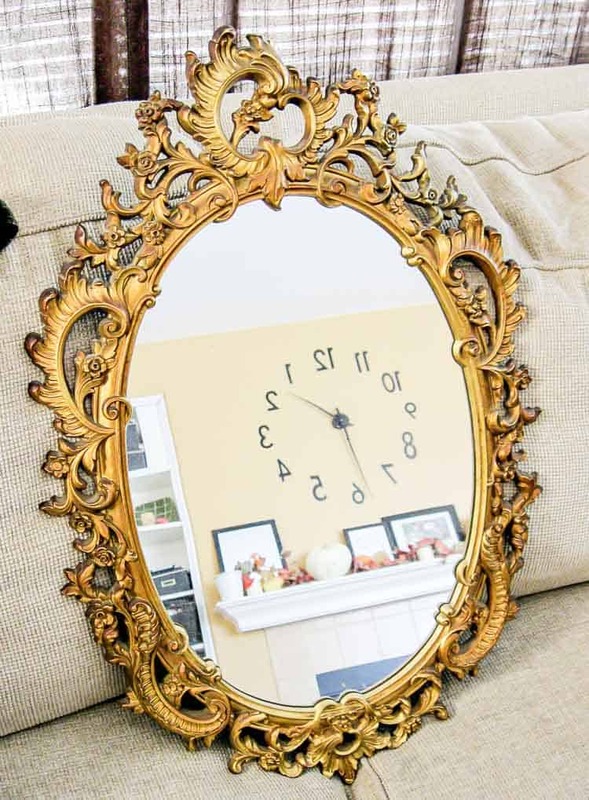 If you put chalkboard paint straight on a mirror it will not hold up long (if you will be erasing and writing on it often). So once the primer is dry you can have fun using the chalkboard paint on the mirror. If you need a second coat go for it. Make sure to let the chalkboard paint dry 24 hours before you put chalk on it. This cute chalkboard has found a home in our laundry room. I just love the creamy white with the chalkboard… so pretty together! Ok friends… you need to check out what my fellow thrift store lovers have made over…. It’s amazing what paint can do! Loving this idea!! It sure was gaudy but now it’s lovely! Incredible transformation. You don’t say, (or that I noticed), what brand of spray paint you used? With all the wonderful formulas of spray paint available, what can’t we do? 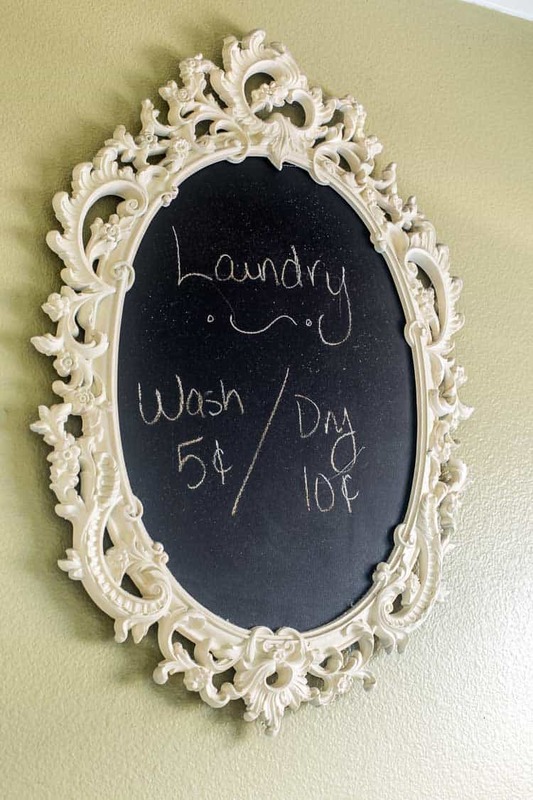 Your chalkboard is one pretty lady now, dressing up your laundry room, snazzy. Good to be able to redo those old goldies into something pretty and useful. Hi Jane Ellen – the paint color is listed in the supply list including a link to purchase. I love this makeover! I have one of those and added a mirror before they started selling them with the mirrors in them. What a great find, If I ever ran across one again I would buy in a heartbeat. Awesome makeover! I don’t know what I’ll do with mine….